once you start reading the first chapter of this book, you won't be able to put it down. brenda starts her memoir with the tragic story of her son zach, and what happened to him when he was merely 4 months old. you are immediately asking yourself why. but her trials didn't end there, her life has been full of them. i have to admit, quite a few tears were shed while reading this book. 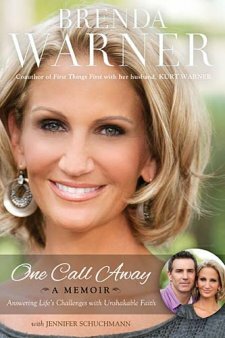 what is more important are the lessons that she learned, and most importantly, that "God has always been one call away." i had the privilege of hearing brenda speak at the women of faith conference i attended last year. i was absolutely captivated by her story and knew i had to read her book. i was truly moved by Brenda's story, her remarkable faith in every circumstance is an inspiration. she did not once let her circumstances in life crumble her faith. through every trial she had two choices, give up or learn from it and move on. i love how honest she is about her mistakes. this book is definitely a must read. thank you brenda for sharing your story with such bravery and honesty.